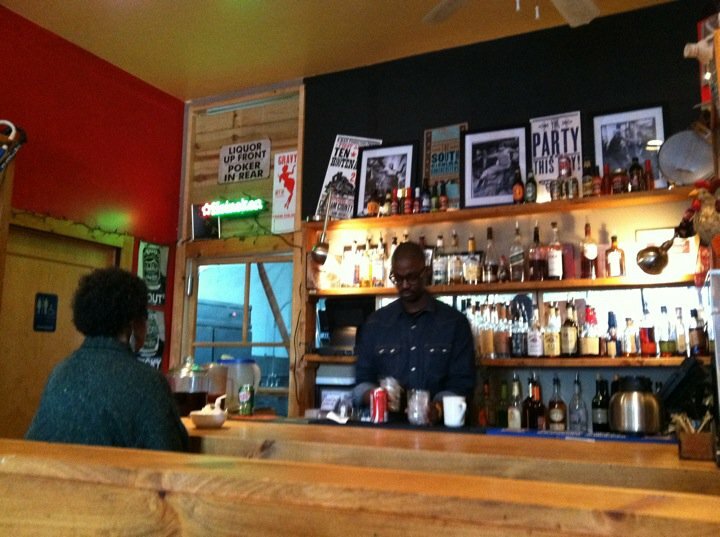 Recently in New York, Brooklyn has become a popular hotspot in terms of housing, bars, and restaurants. All of the restaurant reviewers that I have been following have blogged about the up and coming restaurants in Brooklyn, raving about the innovative interior and the delicious food served. So I, too, have been widening my range of restaurants by visiting places located elsewhere from my local town Queens and Manhattan, branching out to Harlem and to Brooklyn. One of the restaurants that I dined in was noted in Yahoo for having the spiciest chicken in NYC, and I couldn’t help but to head over and try some of their infamous hot chicken. From the name itself, Peaches Hothouse advertises the extreme heat that they use to cook their food. Amanda and I walked in through the restaurant and it was evident that Peaches Hothouse specialized in traditional southern food. We were seated immediately in the small restaurant as our waiter quickly explained the menu: Peaches Hothouse prides themselves in their Nashville Style hot chicken, which is what attracts diners in the first place. Our waiter further explained that there were three degrees of spiciness for the hot chicken, from regular, hot, then to extra hot. Fully relying on our Korean heritage and our distinct abilities to handle spicy food well, we ordered the extra hot chicken, sending our waiter into a state of shock. According to him, female diners like us were the ones who were daring enough to order the extra hot while the male diners who accompanied them settled for the regular. As a side for our extra hot chicken, we asked for a milder flavored corn on the cob. 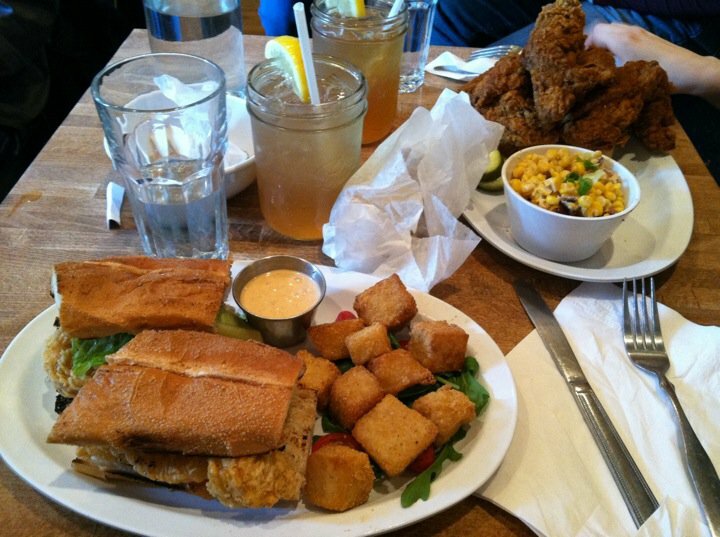 Apart from the chicken, we also ordered the fried shrimp po’ boy with aside of crispy grits. 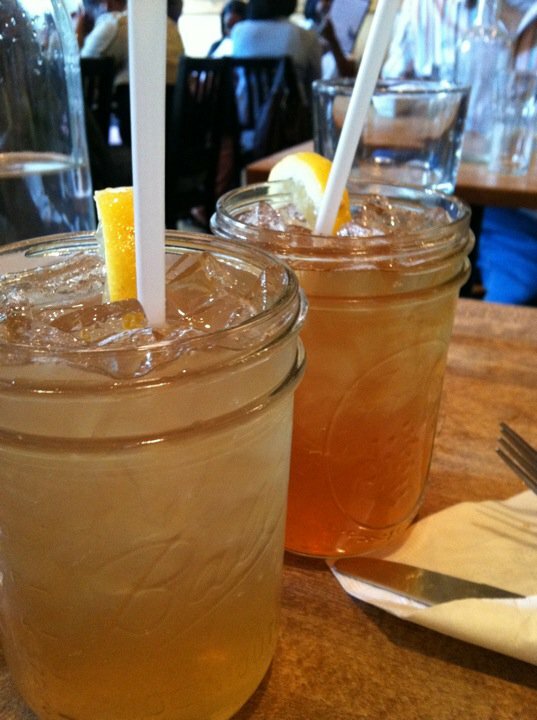 Shortly after ordering our food, our waiter brought out two Arnold Palmers ( ½ iced tea, ½ lemonade) unique glass jugs and freshly baked cornbread. I have a tendency to judge southern restaurants by their cornbread, and Peaches Hothouse impressed me from the start with their warm cornbread. Sweet and crumbly, I had to ask for more of this delicious cornbread as we waited for our food. When our food came out, both of us weren’t too shocked at the look of the extra hot chicken. Sure, it was perfectly cooked – the fried skin of the chicken looked extremely crispy and it was clear that they knew a thing or two about frying chicken. But what disappointed us was how unintimidating the chicken looked in terms of its spiciness. Nonetheless, we dug in and soon realized how wrong we had been. Peaches Hothouse’s extra hot chicken is really extra hot. Although we couldn’t see it, the entire fried chicken breast was dusted with Cajun pepper, making it one of the spiciest chickens I’ve ever had. Taking one bite of this chicken brought tears to our eyes and we had to continuously ask for refills to alleviate the feeling from our mouths. After we recovered from the extra hot chicken, we moved onto the shrimp po’ boy. Everything about this dish was perfect: the shrimp was fried perfectly, the bread was toasted well, and the dressing was a great accompaniment to the sandwich as a whole. The shrimp po’ boy, hands down, had all of the components in making a great southern dish. The sides that we ordered were delicious as well, both the crispy grits and the corn on the cob were perfectly seasoned. Peaches Hothouse gave both of us a spicy food experience that we will never forget, and there’s no doubt as to why they were listed as having the spiciest chicken in NYC. Although their chicken was extremely spicy, it was also extremely delicious and tender. Commuting to Brooklyn is tedious and the train ride is lengthy, but Peaches Hothouse makes all of this completely worth it by providing quality southern food. I strongly recommend Peaches Hothouse if you’re willing to have a mind-blowing, tongue numbing experience, and if you can handle their hot chicken.